By Hirohiko Araki. 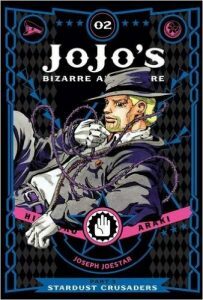 Released in Japan as “Jojo no Kimyou na Bouken” by Shueisha, serialized in the magazine Weekly Shonen Jump. Released in North America by Viz. Translated by Evan Galloway, original translation and adaptation by Alexis Kirsch and Fred Burke. We also pick up a bratty little kid along the way, which I don’t really have too much of an objection to – bratty kids hanging out with heroes is very much a shonen manga trope. I was rather annoyed when she randomly decided to take a shower in the face of ever-present danger, which seems to have been solely to have her be named when faced with such danger. She looks to be about 11 years old, so this was especially annoying. We don’t need that kind of fanservice. I’m not sure how long into the series she’ll last – she doesn’t even have a name to date – but she certainly seems to have taken a shine to Jotaro. As for everyone else, they pose, they shout, and I can’t even remember most of their names. After spending its first two volumes influencing the majority of modern Jump manga, Stardust Crusaders seems to be coasting, confident that it’s popular enough not to worry about getting cancelled, and relying on violence, set pieces, and attempting to look cool. I miss the earlier style.